Tenerife Beaches - there are more than you think! Tenerife Beaches. Many people, who don't know any better, think that Tenerife's numerous beaches are made up of black, volcanic sand that's not very attractive and something that they wouldn't fancy lying down on to sunbathe. Two points: one, any "black sand" beaches aren't black at all, more of a light grey colour and, two, there are loads of beaches featuring golden sand. Many beaches in the main tourist areas have excellent facilities, such as showers, changing rooms and toilets. There are usually sunloungers that can be hired for a nominal fee and police will patrol the main beaches frequently, to ensure everyone's safety. On the links from this page, I'll attempt to list as many beaches as possible, starting in the Las Galletas area and moving round the Tenerife coastline in a clockwise direction. I warn you - it's a long list! Mainly the Los Cristianos area, this tourist town boasts one of Tenerife's finest beaches. Also including Las Galletas. This area of the south coast includes the major tourist areas of Las Americas, Torviscas, Costa Adeje and Fanabe. Travelling on around Tenerife's coastline, we encounter, for a good while, rocky areas, along which are dotted the occasional "beach" - usually a small inlet, but, nonetheless, given a name. One such is Playa Los Morteros. Eventually, the coastline enters this next municipality and features the small village of Abama and the town of Playa de San Juan. 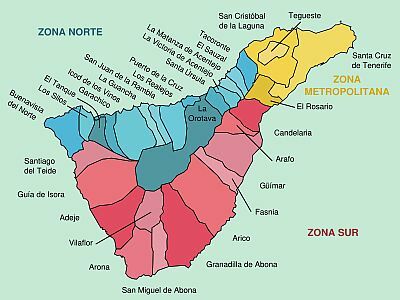 This is the next municipality along the west coast, moving north and includes the major towns of Los Gigantes plus the smaller areas of Puerto de Santiago and Playa de La Arena. Much the same for this municipality. Don't worry, we'll get to more real beaches soon. Containing, obviously, the town of Garachico, we're still faced with a predominately rocky coastline and it's not until we reach the next municipality that we encounter anything like a real beach. It's still quite a rocky coast, I'm afraid, but at least, you'll find one reasonable beach. I say "reasonable"...it's the one attached to the tiny village of San Marcos and consists of a minute stretch of grey sand. It's likely that there'll only be one person on it - you. We can skip the next couple of municipalities. Both La Guancha and San Juan de La Rambla have a mostly rocky coastline punctuated with the odd sheltered cove, which may or may not be called "Playa something". Believe me, they're not beaches. At last, we've reached decent beaches again and Los Realejos features two notable ones. Finally, a major tourist area! As well as a town, it is a small municipal area and contains two important beaches. 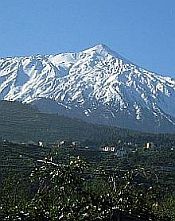 This is one of the larger municipalities, having Mount Teide itself within its boundaries. As most of it is inland, it has only a tiny piece of coastline, which, nevertheless, features a few notable beaches. Much of the Tenerife coastline, whilst rocky (as you've already read, above) has the odd stretch of beach amongst the cliffs and we come across one now - Playa Arenas, just near Mesa del Mar. From here, seeing as we're now on the far north coast of Tenerife, it's rocks, rocks and more rocks, all through the municipality of San Cristobal de La Laguna. The municipality eventually hands over the coastline to Santa Cruz de Tenerife and things finally start to get interesting again. The coastline of this municipality takes us all the way round the far north-eastern tip of the island, which is extremely rocky. Here and there, you get the odd inlet that is called a beach, but, it's not until we start down along the eastern coast, approaching Tenerife's capital city, do we encounter, finally, some important beaches. This is the next municipality, moving south along the east coast and features two contrasting beaches in the same area. In this next municipality, there is the major beach attached to the town of Candelaria itself, plus a few tiny ones. Only a few tiny beaches to be found here, but worth a mention anyway. This is the next one, moving south and its short coastline is graced with a couple of nondescript "beaches". Playa del Abrigo is a crescent of rough sand and stones and, quite frankly, should count itself lucky to be even considered a beach. The village of Las Eras has its own "beach" (Playa de Las Eras) that is also pretty rocky and grey. This quite large municipality has a handful of beaches, of various degrees of quality. This large municipality has quite a long coastline that includes the tourist destination El Medano, featuring several important beaches. This municipality includes both Golf del Sur and Amarilla Golf and has just three unremarkable beaches.